Are you a Downton Abbey fan like me? I enjoy period dramas and this one is excellent. The writer, Julian Fellowes, did a super job bringing history to life. His drama series outlines the changes the First World War and its aftermath brought to British class structures. He certainly cooked up some delicious humor and added a generous helping of soap opera which made this series a runaway success. The costume and jewelry were wonderful thanks to designer Susanna Buxton's attention to detail. Evidently I am not the only one who enjoyed seeing the designs. Some intrepid designers have come up with their own Downton Abbey inspired jewelry tutorials. Above is Maegan's bead and lace choker design tutorial. (update : The link is no longer available) Definitely an upstairs design! The actresses who played the servants had to wear less attractive outfits but still, some of the uniforms had interesting lace trims. Shannon, who writes the Madigan Made blog quite liked the ruffled head dress worn by the maids. 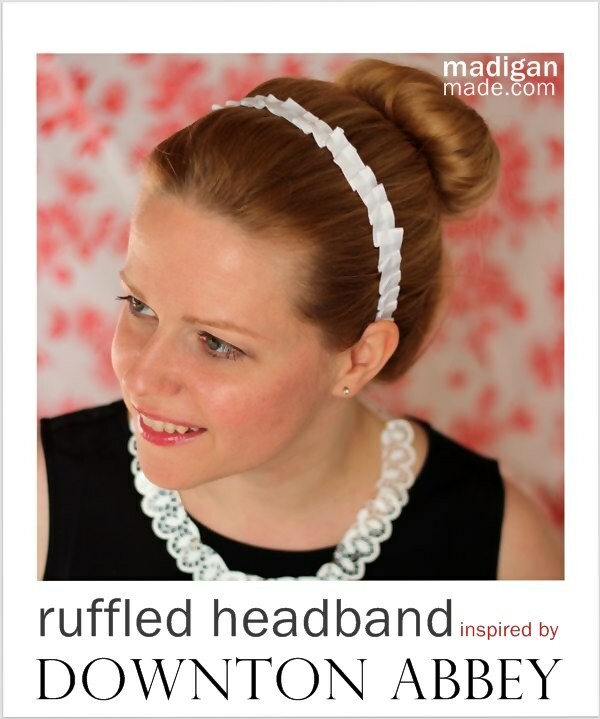 So she created the ruffled headband tutorial AND one for a faux lace necklace. 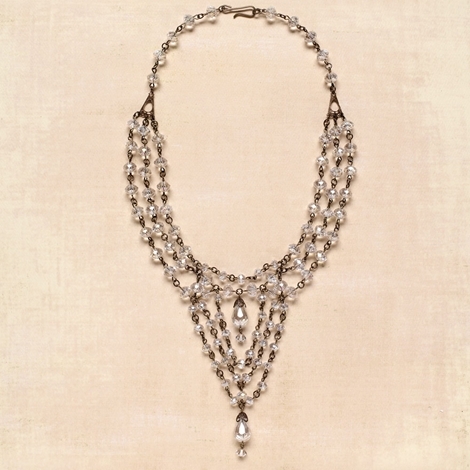 Also check this past chain necklace tutorial for an awesome Downton Abbey look. 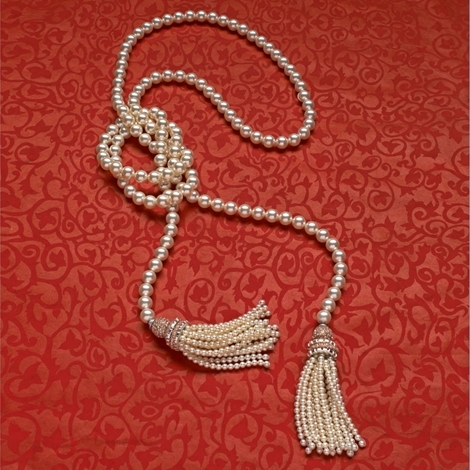 Kelsey Lawler wrote "Downton Abbey" Jewelry on Bead Style's site which featured 10 necklaces which looked like they could have been worn by one of the Crawley sisters. I especially liked this beautiful pearl lariat necklace by Bethany Eddy which appears in the March 2013 issue. A couple of the chain necklaces were also standouts in Kelsey's writeup. The first inspirational draped chain design by Cathy Jakicic first appeared in their 2011 Crystals issue. This yesteryear bib design tutorial by Suzette Bentley also suits the period. You can see similar design elements from these pictures of Lady Cora and Lady Mary in their finery. 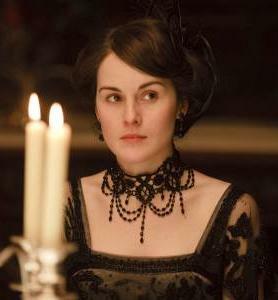 (Picture source) Lady Mary is wearing mourning jewelry as this early scene was played after they lost the heir to the throne when the Titanic sank. Downtown Abbey looks to be an amusing and entertaining production. Not sure how I've missed it but will have to see if it is broadcast on our BBC. I do love the romantic feel that these period pieces of jewelry evoke. The wonderful thing about historic fashions is that they give the future inspiration. I don't watch any tv any more. But I downloaded all the available seasons from iTunes! I love, love, love Downton Abbey. This post is fabulous. The jewelry from this period is so romantic. I also love the hats and have bought a couple of cloches lately! I quite liked the first choker but the link seems to be broken. All the designs are lovely and have made me want to at least check out the show. Thanks for another great read! The link is no longer available - the blogger updated her entire site and her older designs don't seem to be available. However. I will try and do a post on the best lace choker tutorials in the near future!